Price Improvement at the Preserve at Corkscrew. 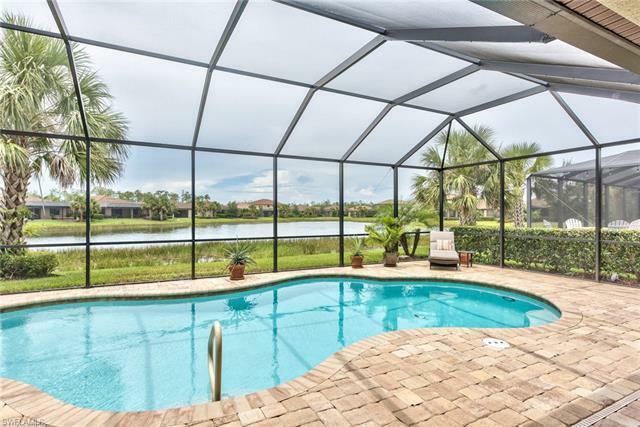 This Cameron model, lake view, pool home is move-in ready. Owners will love the curb appeal with tile roofs and paver driveways along with the care to detail taken in this community. Affordable HOA fees include Irrigation water, Outside Pest control, Irrigation Water, Lawn/Land Maintenance, Recreation Facilities, Guard Gated Entry and much more. As you enter the foyer you will notice the beautiful glass front door, high baseboards, crown molding and tile throughout the main living area. There is plenty of room for the family with three bedrooms plus a den and three full baths & a popular open floor plan that lends itself well to entertaining guests. Large kitchen with lots of space, 42" cabinets, center island, & counter with breakfast bar. Large master with walk-in closets, dual raised vanity sinks. Relax by the resort pool and spa, play a pick-up game on the sports courts. Enjoy easy access to shopping and dining and the breathtaking gulf coast beaches nearby. Sports fans will enjoy living just minutes from JetBlue Park, home to the Boston Red Sox Spring Training, and Germain Arena, home to the Everblades.